Part V of a five-part series on the history and future of the blogosphere. Matt Stoller (yes, him again) gives me the perfect counterweight to what I am about to say here. If taking the House happens, it’s going to be brutal for the Republicans, on a political and personal level. It’s not just the destruction of the K-Street project, the investigations, the minimum wage increases, etc. In DC, it’s not just that thousands of good policy jobs in DC will leave the Republican party and go to Democrats in the House because two thirds of the committee staff are going to switch from R to D. It’s the little things, like the fact that the crappy old used blackberries that Democratic staffers get on the hill because of the Republican administrators are vindictive will go to Republicans instead. It’s the little touches that are meant to wreck Democratic dignity that will be turned around. And with that turnaround, hopefully Democratic pride will come back. We will be winners, and they will be losers. While the policy objectives in 2007 are important, I think it’s more important to focus on the first fight that’s going to happen. It’s critical that the Democrats pick one specific fight, fight it, and humiliate their right-wing opponents. Be vindictive. Treat them the way you were treated. It’s not just fair, it’s immoral to do otherwise. They must pay for the norms they violated, the brutal civic tissue they ripped up for power. Here’s where things have to go. A return to general principles – an articulation of what our common ground is, in such a way that every American feels a sense of ownership and camraderie to the ideas being put forth. Maybe He is against privatization of Social Security, whereas She is for it; but both should in general be for the right of Americans to grow old with dignity after a lifetime of labor, without fear of financial and social armageddon, as so characterized the experience of aging in this nation before FDR’s New Deal. How we get there is one thing, but we should at least agree on first principles. Let us seek those principles. Shouldn’t abortions be rare? Shouldn’t entrepeneurs be encouraged to take risks? Shouldn’t employees be judged on merit rather than skin color? Shouldn’t consenting adults retain privacy over their affairs? Shouldn’t sovereignity of the self remain free of external imposition? Shouldn’t we have a right to the fruits of our own labors? Shouldn’t we be free? Shoudn’t all of mankind be free? These are the questions that we should be asking of each other, across the red-blue divide. Such a dialouge is impossible however, when conducted under the purview of that dated framework. Instead, we have to conduct the debate as neighbors, as friends, as co-workers, as Americans. Leave your party ID at the door and take this colorblind map of the states with you – we need policy, not ideology, to be the driving force of our discussions, for our own benefit and that of future generations. At this point, it is fairly clear that we are going to score a resounding victory in the midterm elections of 2006. We’re almost certainly going to take the House, and possibly the Senate as well. There’s going to be a meeting of the winning minds over what to do with the losers. As an important part of the victory, bloggers are almost certainly going to be a part of that roundtable. In many ways, the situation recommends the 1919 Treaty of Versailles, at which the leaders of World War I’s victorious nations cam together to decide the future of defeated Germany. Like today’s Republicans, the Germans were unquestionably one of the most arrogant and shameless regimes in modern history; like today’s Democrats, the Allies were a strange amalgam of nations with different agendas, brought together by their common enemy. At Versailles, with the enemy vanquished, all these different goals came to the fore. 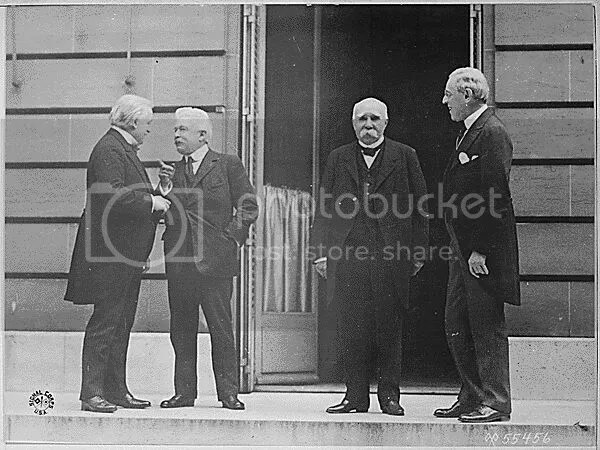 The chief dispute was between American President Woodrow Wilson and French Prime Minister Georges Clemenceau. As leader of the nation that had borne the brunt of German depravity, Clemenceau wanted no quarter given to the defeated nation; in fact, he wanted the Treaty Conference to metaphorically sow the soil with salt so that the Germans would never again be anything more than a vassal nation, and could pose no threat to European security. What of our pledges to the men that lie dead in France? We said that they went over there not to prove the prowess of America or her readiness for another war but to see to it that there never was such a war again. If you know anything about my affinity for Wilson, you know how I come down on this argument. Wilson, a flawed but nonetheless prescient leader, correctly foresaw that an eye for an eye would not only leave the whole world blind but would result in a bitter and vindictive Germany that would rise to fight again in a generation. The only way to prevent Germany’s injustice from repeating itself was to treat Germany better than Germany had treated America; in order to elevate the international discourse and prevent the spoils system from holding sway over peaceful eras, the United States had to take the first step. Though I have strong positions on the issues, they have never been my primary motivator in politics. I am more interested in politics-as-metaphor; the idea that a leader could become ascendant while opposing noble traits like honesty, decency, and integrity galls me even more than the policies such a leader would impose. Accordingly, my hatred of Repulicans stems chiefly from the tactics they have used to thwart democracy and the popular will: their power-hoarding, their corruption, and their willingness to say anything to get elected. I am more interested in rooting out this kind of politics than I am in taking power for my own team. So if the newly-ascendant Democrats decide to take out their pent-up frustrations on their erstwhile abusers after the election — if they follow Matt’s advice and head down the road of Clemenceau — I will have no part of that. Because the only way we can make politics decent again, the only way we can provide for a better tomorrow, is if we follow the lead of Aziz and in the steps of Wilson: take the first step towards a new, honest, fair, and merciful governance. If we proceed, as Lincoln said, “With malice toward none, with charity toward all,” then we will have achieved a lasting victory; if we become the same sort of bullies that we have been fighting for the past six years, then we will have won the war but lost the peace. We will then have nothing to look forward to but a resurgent opposition composed of the worst elements of the Republican Party, bent not on good governance or fair dealings, but on our destruction. And they will have a point. This entry was posted on Saturday, October 6th, 2007 at 7:24 pm and is filed under Uncategorized. You can follow any responses to this entry through the RSS 2.0 feed. Responses are currently closed, but you can trackback from your own site.